Those awaiting results of October 2015 Electronics Engineer (ECE) and Electronics Technician (ECT) board exam can find here the complete list of passers, top 10 (topnotchers), top performing school and performance of schools as the Professional Regulation Commission (PRC) and the Board of of Electronics Engineering (BEE) officially released results in 3 working days after the last day of exam. PRC on Thursday night, October 29, 2015 announced that 1,784 out of 4,467 passed the Electronics Engineer Licensure Examination and 2,984 out of 3,518 passed the Electronics Technician Licensure Examination. The second Electronics Engineering board exam this year was administered on Saturday and Sunday, October 24-25 (ECE) and October 26, 2015 (ECT) in the cities of Manila, Baguio, Cebu, Davao and Lucena. 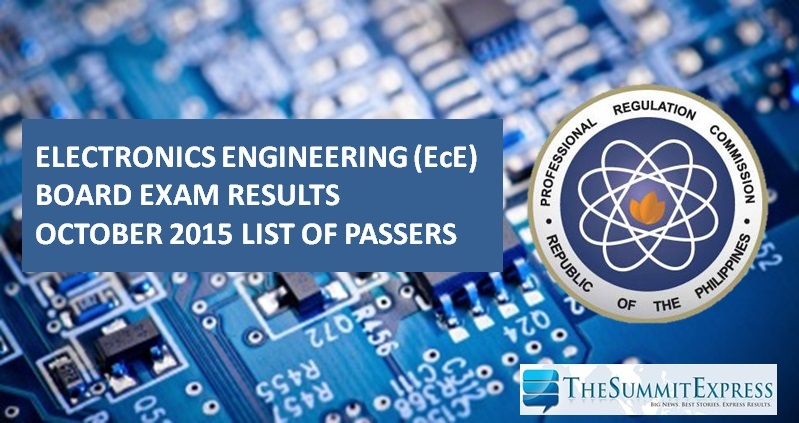 October 2015 ECE board exam covers the following subjects: Mathematics, Electronics Engineering, General Engineering and Applied Sciences (GEAS) and Electronics Systems and Technologies (EST). Programs for ECT board include basic math, electronic and electrical equipment, Philippine Electronics Code and Electronics Engineering Law of 2004. In September 2014, results were announced online after 3 working days. A total 1,532 out of 4,851 (31.58%) passed the Electronics Engineer Licensure Examination and 2,502 out of 3,033 (82.49%) passed the Electronics Technician Licensure Examination. In April 2015, results were also out after 3 working days. PRC named 892 out of 2,552 (34.95%) who passed the Electronics Engineer Licensure Examination and 1,066 out of 1,483 (71.88%) who passed the Electronics Technician Licensure Examination. Like Us on Facebook or Follow Us on Twitter to receive updates about Electronics Engineering licensure exam.